-The Pens win again: I don't think they could lose if they tried right now, as they picked up two more points in a very big game against Florida last night. As you can see in the video above, Sidney Crosby didn't miss a beat, scoring a highlight reel goal assisted by Bill Guerin. That's a sentence I couldn't have even typed at the beginning of the week. 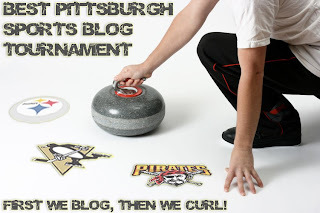 -The Pittsburgh Sports Blog Tournament is in the final round, and barring a major miracle, it looks like Mondesi's House is going to finish as the runner-up to The Pensblog, which is as solid of a blog as you'll ever read. Thanks to all of you who put MH in the finals. Voting ends at 5 PM tonight. Anybody have thoughts on KENNEDY! not being named one of the 3 Stars last night? Yeah, I'm sure Pitt is scared to death of facing a team that put up 38 points against Illinois. If that game were to happen, I'd rest most of the team, put only Young, Blair and Fields in and still take Pitt to win by double digits. Its always nice to hear about my former hometown (New Castle), even if its something really odd. The only time New Castle makes the news is for something strange, absurd, or criminal.